I started working for Whistler Blackcomb Ski School in 1999. I taught for a few years and then was the adult ski school admin assistant. I knew 1400 names and close to as many faces – I could freak people out by knowing their name, email address and various other bits of personal info (privacy laws were fairly non-existent in those days). My husband teaches ski school, his parents teach in their retirement and most of my friends at some point in time have taught for the ski school. Why do I mention this? Well I have been heavily involved in the ski school for a long time, I know its inner workings and I know the amazing teams that work there however even with that much familiarity it’s nerve wracking to drop your child off at ski school for the first time. 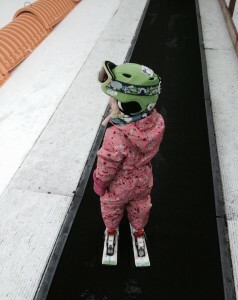 She has been at nursery for two years but ski school is somehow different. 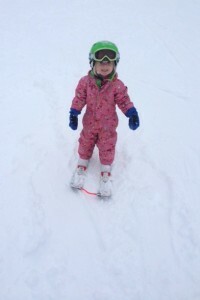 Firstly there is the hype – months and months of other parents saying “Wow – you are big enough for ski school” and a little blank face looking up wondering what it’s all about. Then there is the equipment – does it fit, what do they need, they will for sure lose a glove, can they carry their skis? How many layers should they wear, what happens if they can’t get it all off to go the bathroom on time; hat, neck warmer or balaclava? And then there is the physical side – it’s cold, are they strong enough to ski? will they be able to do it? how exhausted will they be at the end of the day? Will the meltdown be worth it?! Tory is the Oyster representative in Whistler and has been working with us since 2003. Sign up to our Whistler ski instructor course and job programme to meet Tory when you arrive at Vancouver airport!